Every HVAC Company claims they are better, faster, stronger… and cheaper. But, customers are not stupid. They know that no one can have it all. And now you have a simple way to show that you are BETTER. A quality installation certificate from ENERGY STAR or ACCA. A benefit of becoming an ACCA QA accredited contractor is your ability to offer a Quality Installation certificate from ENERGY STAR or ACCA! How? It’s easy! Download the ACCA QI mobile app, set up your My ENERGY STAR Account (MESA), and start submitting projects for a QI certificate. 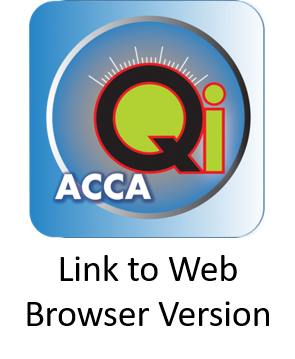 An introduction to the QI mobile app, in support of the ACCA 5 Quality Installation (QI) Standard. An overview of the ACCA QI mobile app for HVAC business owners and managers. What HVAC system designers need to know about the ACCA QI mobile app. A walk through the QI mobile app for Installers and Start-up Techs. A guide to start using the QI mobile app for HVAC businesses. A step-by-step walk through the process to add technicians and system designers to your company records… so they can use the QI mobile app.